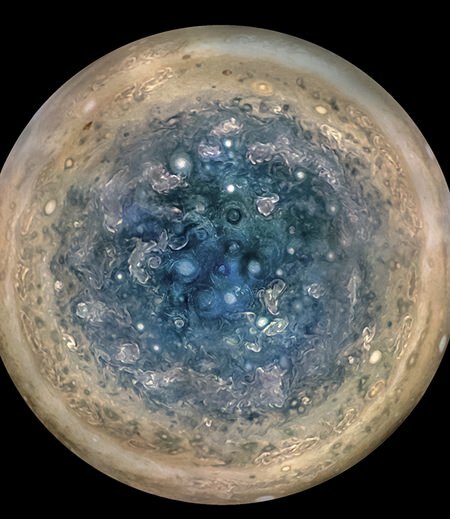 Cape Canaveral, Fla. (AP) – Monstrous cyclones are churning over Jupiter’s poles, until now a largely unexplored region that is more turbulent than scientists expected. Turning counter-clockwise in the northern hemisphere just like on Earth, the cyclones are clearly clustered near the poles. The diameters of some of these confirmed cyclones stretch up to 1,700 miles (2,800 kilometers). Even bigger, though shapeless weather systems are present in both polar regions. At the same time, the two poles don’t really resemble each other, which is puzzling, according to Bolton.